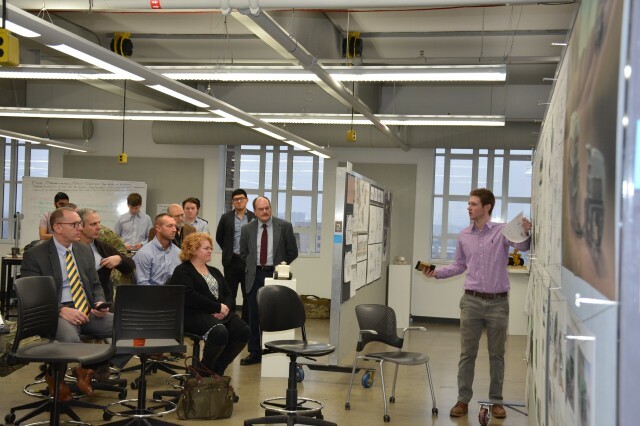 DETROIT-- Soldiers from the Michigan Army National Guard Tuesday capped off months of participation in a project to design new vehicle concepts for the U.S. Army at the College of Creative Studies (CCS) in midtown Detroit. The project, called Soldier Innovation Workshop, is developed and organized by the U.S. Army Tank Automotive Research, Development and Engineering Center (TARDEC), located on the Detroit Arsenal in Warren. The workshop brings together TARDEC's engineers and scientists, industrial design students from CCS, and Soldiers from various disciplines to build new ground vehicle concepts to tackle the Army's biggest challenges. This iteration began with a problem statement instructing the participants to look at the Army's sustainment needs in austere environments. 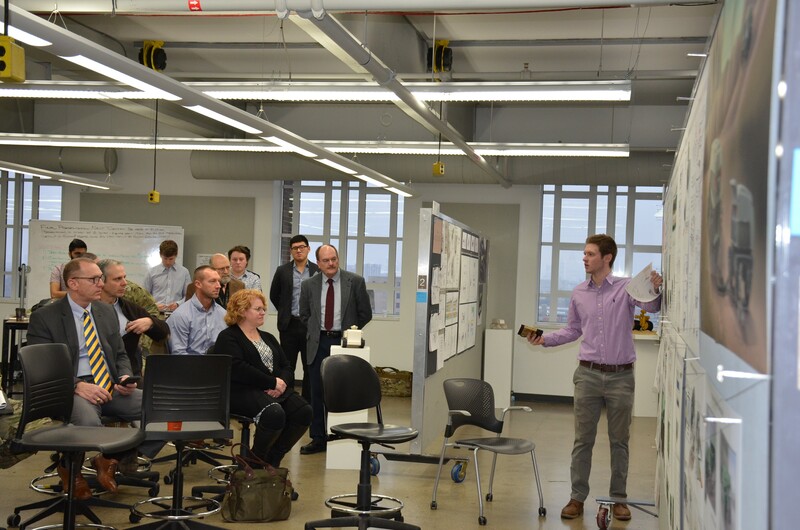 A multi-day brainstorming, sketching, and innovation session leads to months of concept development by the students, culminating in Tuesday's final concept out brief. Among the National Guard participants is Maj. Stephen Lemelin, 46th Military Police Command. "Because we were part of the mission for crisis response, we looked at vehicle use very differently than the active army personnel who would look at a concept from a combat situation perspective and say, 'nah, we can't really use that,'" said Lemelin. "But for a non-combat situation, it was actually excellent design. We'd tell them, 'make sure you think about this,' because it may not be for the combat missions, but for the other half that seems to get bigger every day. It's actually much more important." It's these uses that the project looks to get at. "Talking about what it could do to help people, water purification," said Lemelin. "Previously we had some guys who looked at power from algae and other secondary sources, building materials, all of those things that weren't as important to the combat forces. We were looking at them from a disaster response point-of-view." "Ultimately, some of this can show up one day," said Jeffrey Langhout, Director, U.S. Army TARDEC. "This is how we shape the future, explore the realm of the possible and beyond. These young men and women aren't burdened by the curse of, 'how it's always been done,' and from that mindset, we get some of our greatest ideas." 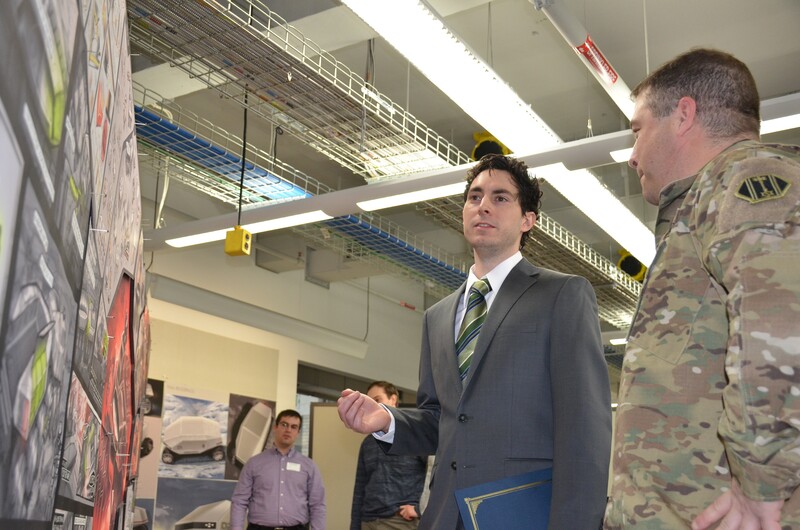 TARDEC has been organizing Soldier Innovation Workshops for more than five years, focusing on topics from arctic mobility, command vehicle designs, Next Generation Combat Vehicle concepts, and more. "From a long-term national security perspective, we need our young people to be hanging out with our men and women in uniform," says Langhout. "That's what makes this Army go." Previous outputs from Soldier Innovation Workshops have guided vehicle prototype developments, both physical and virtual, and informed the way new technologies are integrated on new vehicles.